Yesterday, in Columbus, Ohio, I captured an adult female Rufous Hummingbird that was already banded. The band number was Y14779. If this is your bird, I'd really like to hear from you! 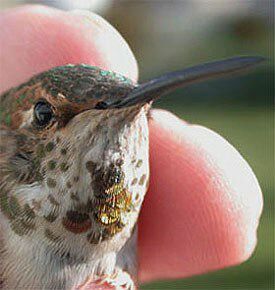 Any time another bander reports the capture of a previously banded hummingbird, it gets the attention of everyone in the small community of less than a hundred hummer researchers. Although addled a bit by post-surgery pain-killers, we scrutinized Allen's Internet report and thought the band number sounded a little familiar. Hummingbird bands have only a letter and five digits, and our current series starts with a "Y." A quick check of our inventory confirmed the band had been issued to Hilton Pond Center--and that the bird should have been one of the winter vagrant hummers we travel the Carolinas to investigate. As we thumbed through our files of winter hummers, we saw the numbers and locations of two dozen vagrants we'd banded from 2000 through 2002: Rufous Hummingbirds from places such as Pinnacle Mountain SC and Casar NC; Calliopes in Gastonia NC and Bethany SC; plus a Black-chinned AND South Carolina's state record Buff-bellied Hummingbird from Lexington SC. These birds all brought back great memories, but the card for Y14779 was missing from the stack. At first we were confused and disturbed--until we remembered Y14779 had not been banded at one of these distant sites. 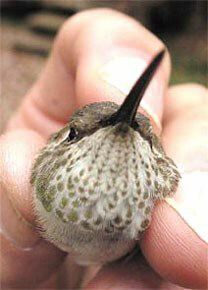 Nope, this bird was a very special case: a female Rufous Hummingbird that was trapped on 20 November 2001--and the very first winter vagrant hummer ever to be observed and banded right here at Hilton Pond Center! When we caught her last November, she quite obviously had hatched in 2001 and bore the plumage of a young female--including a complete lack of iridescent red-orange throat feathers (top left). We chronicled the events of Y14779's arrival at the Center last year under Santa Comes Early, On The Wings of A Hummer, our installment of "This Week at Hilton Pond" for the week of 15-21 November 2001. In that photo essay, we expressed our excitement over finally getting a vagrant hummingbird at the Center, but we can assure you it's far more exhilarating to have one's banded hummer show up elsewhere. 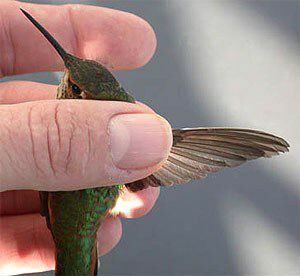 After all, of the few hundred thousand hummingbirds banded in the past half century, only a few dozen have been encountered away from their original banding sites. Banders are having somewhat better luck with winter hummers in the eastern U.S., probably because these vagrants are highly noticeable in cold months when hummingbirds "aren't supposed to be here." On 29 November 2002, I hopped into my hybrid electric Toyota Prius and left the Detroit area for for a 600-mile round-trip to Ohio to capture and band two Selasphorus hummingbirds. I arrived at the home of Sandra & John Langendorfer in southwest Columbus around 9:45 a.m. Bob Sargent [an Alabama bander] had clued me in to this bird, present since 27 October and about which Sandra had e-mailed him a couple of days before. The temperature was only 34 degrees F, and the 25 mph headwind I had been driving into all the way down had not let up. From past experience, I'd learned to set up my banding table and supplies before I actually set the trap, as most Rufous have been quick to enter. The Columbus bird was no different, and only five minutes after I placed a feeder inside the trap, she flew in and I had her! Usually I can see if a bird is banded when taking it out of the trap, but this time I did not. Only when I began to measure her did I find that indeed she was a banded Rufous Hummingbird (S. rufus), and she wasn't one of mine! What a spectacular find! 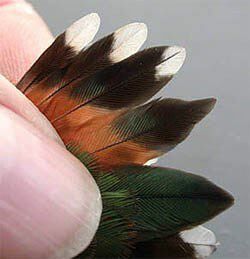 She was an adult female with a weight of 3.8 grams and 21 metallic gorget feathers (top right), quite a lot for a female. She was definitely an adult since her bill showed none of the characteristic corrugations of a juvenile. This evening, I discovered through Internet inquiry that she had been banded by Bill Hilton Jr. at Hilton Pond Center for Piedmont Natural History, on 20 November 2001. Where she's been since last year, we don't know, but at least we have a connection of two data points now, albeit a slightly confusing one! Y14779 causes even more confusion when we consider where she "should" be at this time of year, and it's neither York SC or Columbus OH. 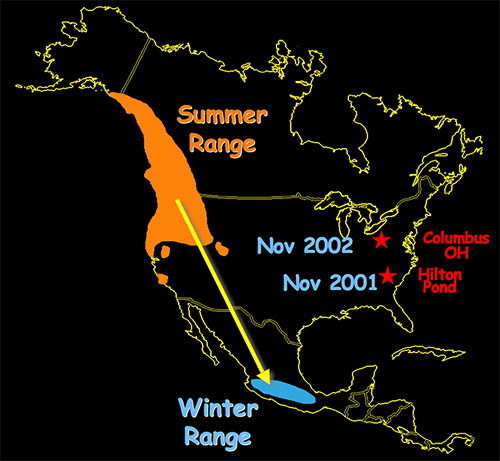 After leaving their breeding grounds in southern Alaska, western Canada, and the northwestern U.S., the vast majority of Rufous Hummingbirds migrate to central Mexico for the colder months. Historically, a few Rufous have showed up east of the Mississippi during winter, but in recent years these winter sightings have become almost "epidemic," with dozens of birds observed and/or banded in the eastern U.S. from Maine to Michigan to Florida. To be honest, ornithologists have no idea what's going on with these birds--and especially with wanderers such as Y14779 who showed up in South Carolina one winter and almost exactly a year later was retrapped about the same distance eastward but 350 miles further NORTH. 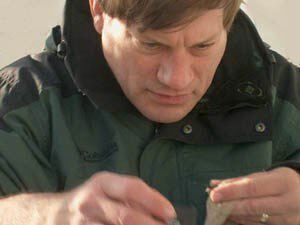 As one of the northernmost researchers in the hummingbird bander network, Allen Chartier is doing great work. Not only did he recapture Y14779 in Columbus, Ohio, but he has two significant Rufous Hummingbird retraps in Michigan: in November 2001 he caught a Rufous banded in December 2000 in western North Carolina, and in November 2002 trapped another that had been banded in Louisiana in January 2001. There's so much to learn about hummingbirds, and its quite apparent that cooperation by homeowners such as Sandra & John Langendorfer and collaboration among and between hummingbird banders (including Allen Chartier at right, handling Y14779, as photographed by Sandra) will be required if we can ever hope to learn the causes behind the apparent increase of western hummers in the the eastern U.S.
Having been to Hilton Pond Center in 2001 and Ohio in 2002, we can't help but wonder where Y14779 will show up NEXT November. If she speaks French, maybe it'll be Montreal! "This Week at Hilton Pond" is written and photographed by Bill Hilton Jr., executive director of Hilton Pond Center for Piedmont Natural History. --See Whatizit? for a photo of a butterfly sighting made on 24 Nov 2002.